CrossFire combines the fast-acting, broad-spectrum control of metofluthrin with the long-term control of clothianidin in an innovative dual-action formula, made even more effective by the included synergist PBO. This approach allows CrossFire to knock down the bed bug population quickly and provide up to 4 weeks of residual control afterwards. Can not be shipped to New York. CrossFire is one of the newest formula targeted specifically for bed bugs, and it's been in development for years. It's a fast-acting and hard-hitting residual spray from MGK. CrossFire combines two active ingredients, metofluthrin and clothianidin, for that dual action effect. By combining a broad spectrum contact killer with a long-lasting, chemically stable residual, CrossFire is able to deliver a quick knockdown of the population and continue to kill over time. Both chemicals penetrate the bed bugs' exoskeleton and attack their central nervous system. This causes their nervous system to overreact, causing paralysis then death. CrossFire is non-repellant, and kills within 5 minutes of exposure. 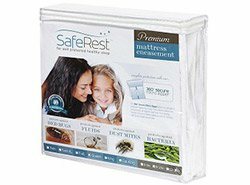 It's also been proven effective against resistant strains of bed bugs and their eggs. What’s interesting is that CrossFire is currently the only liquid concentrate we offer that doesn’t have a signal word on its label. This means that CrossFire’s ingredients are considered to have minimal toxicity to humans. Even so, we still recommend that you follow the basic safety guidelines suggested by the EPA and the manufacturer. This includes wearing long sleeves, shoes and socks, and taking care to keep the chemicals off your skin and out of your eyes and mouth. CrossFire is a modern and unique approach to bed bug sprays. Its dual-action formula makes it effective as both a contact killer and long-term residual, and the broad indoor labeling and minimal toxicity make it an ideal choice for treating homes and apartments for these persistent pests. CrossFire is the result of years of development by MGK. It's the first liquid concentrate designed and labeled specifically to kill bed bugs. 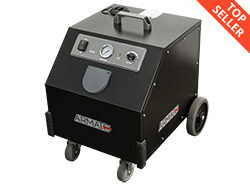 The result is a kast knockdown and kill with direct spraying, plus residual control. 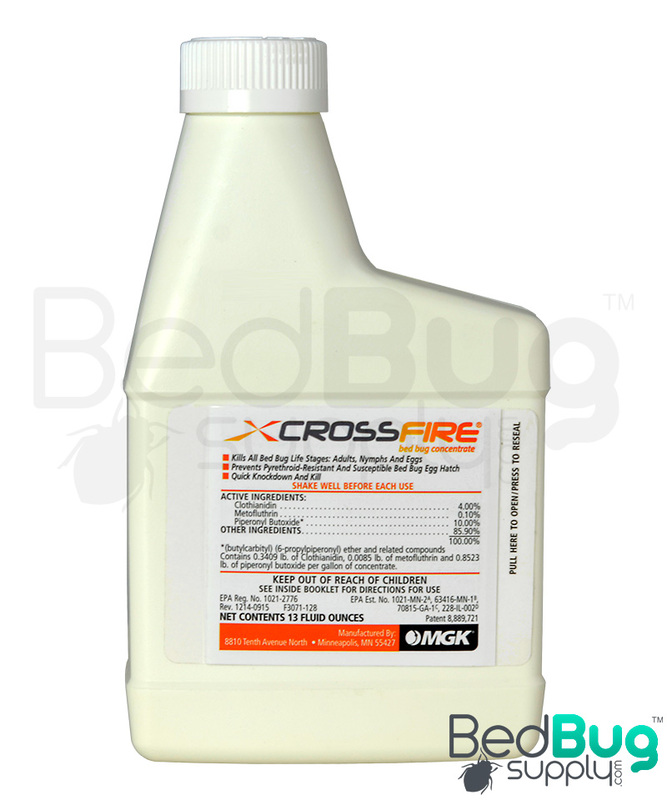 CrossFire targets all bed bug life stages and is specifically formulated to kill pyrethroid-resistant bed bug strains. 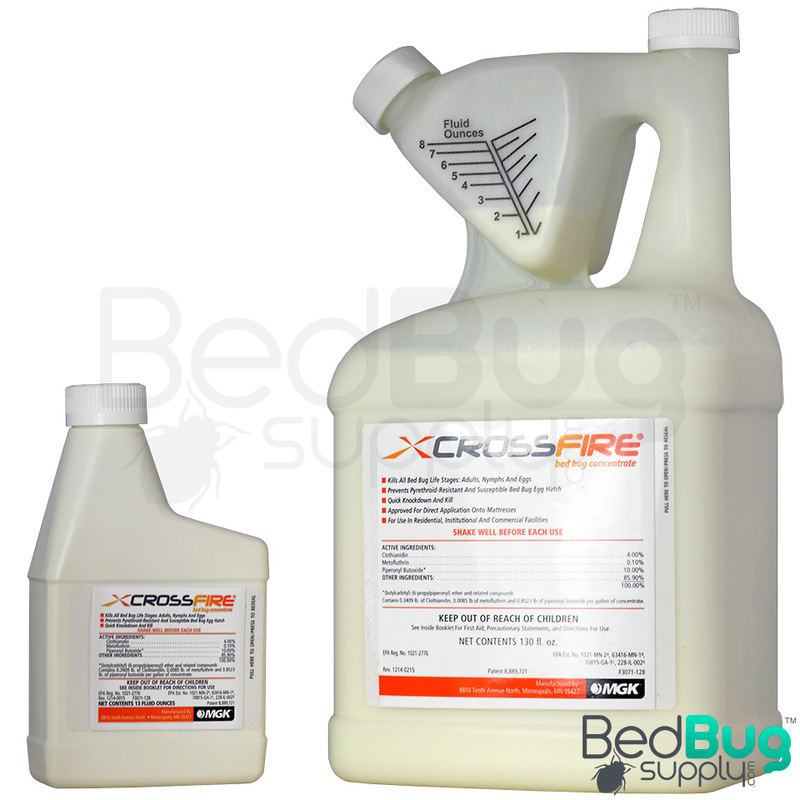 To use CrossFire in a bed bug treatment, mix 13 ounces in a gallon of water. Start with a half gallon of water in your spray tank, measure out and pour in the CrossFire concentrate, then add the other half to start agitating the mixture. Shake the tank to make sure it mixes thoroughly and you're ready to go. Apply CrossFire to cracks and crevices, like on or around baseboards, floorboards, bed frames, headboards, furniture, door and window frames, closets, beneath floor coverings, and the edges of the carpet. CrossFire can also be applied directly to the seams and folds of your mattress and box spring. Spray until the fabric is damp but not wet, and wait for the bed to dry before you put your linens back on. Make sure that you read and follow the product label and MSDS for safe and effective usage. Q: Is this product safe with pets.. more specificly, dogs and cats? Once dry, it is safe for pets to come in normal contact with. Make sure to read the product label and MSDS for safe and effective usage. Q: I live in a small studio apartment ( approx 420 sq feet ) and used this recently. With one gallon, I sprayed everything in sight chairs, beds, floors..everything and had product left. Can it be opened and used in 1/2 quantity increments ( 6.5 per 1/2 gallon water ) or once it's opened the entire product must be used? A diluted tank mix can be stored overnight, but shouldn't be kept for longer than that. If you have product left in the concentrate bottle itself, that will have a shelf live of a few months as long as it's sealed and kept in a cool, dry place. Third time I ordered. No problem at all for a month after first supply. Second order, six weeks or more. Third order I am hoping to be free of problems. Regardless, no other product even comes close over long period of time. thank you. Reviewed by: pat h from ohio. Reviewed by: R Sanders from Arlington Tx. After getting 2 estimates that just about sent me into a stroke, I started researching a more cost effective way to get rid of these. I have realized that the majority of the cost involves labor moving everything around. Purging your housing is the first thing. As hard as it was to have to throw away sentimental things, living with these things made it easier. I was do confused on what to use to do it myself. If you dig enough, you can find what the professionals use. That being said, I used a combination of Crossfire and Gentrol. I ordered 2 because I knew I was going to do a second application in a month. Well, I didn't take any chances, going with the theory that more is better. I ended up using a whole bottle upstairs and a whole bottle downstairs. I came back a couple hours later and dead bugs. Haven't see a one since but plan on doing a follow up in a month with just using 1 bottle for upstairs and down. Reviewed by: Lynda Daggs from Keokuk, iowa. Reviewed by: james from Hollywood. Seems to be adequate product. 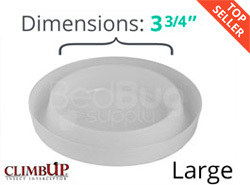 Does as good as any other product on bedbugs. But low odor is a big plus! Reviewed by: Arlis Spearman from Arkansas . Reviewed by: Roger Johnson from Chicago. This did better than the last product i bought (temprd sc). It is diffently working. Reviewed by: Lisa mault from Lima. Reviewed by: Roger from Chicago . This product contains the 2 insecticides for immediate and long-term extermination that bedbugs are not resistant to. Reviewed by: Craig Crawford from Dayton. It is an expensive product, but if it actually works, it will be worth it. Product was packaged well and product was delivered in a timely manner. Reviewed by: Catrina from Burns.